Facebook has made an announcement in its developer blog - an announcement which can result in another uproar over the way Facebook handles user privacy. According to the blog post, developers of third-party apps can now have access to users' phone number and current address as a part of the User Graph object. The blog post also made it clear that users need to grant permission to the app before it can access their phone number and current address. Because this is sensitive information, we have created the new user_address and user_mobile_phone permissions. These permissions must be explicitly granted to your application by the user via our standard permissions dialogs. However, Facebook has not made any announcement to its 600 million users that when they take their next quiz app (or any app for that matter), they could be potentially allowing the developers access to their phone number and current address. 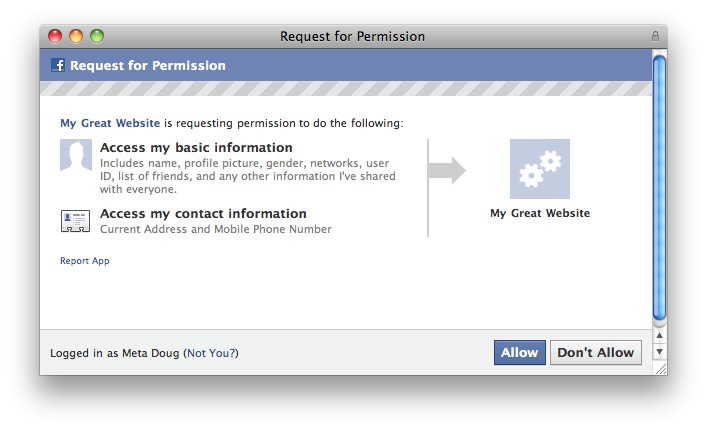 And Facebook have not made things easier with the dialog asking for permission. As you can see, the dialog does not explicitly highlight the fact that by clicking on the Allow button, users are giving third part developers the right to get access to their phone number and address - which are, as Facebook have said, sensitive information to anyone who cares about privacy. In the absence of any notification about this new information apps can access from their profile and the lack of any highlight of this fact in the permission dialog, the majority of users are likely to not notice the addition of Current Address and Mobile Phone Number and just click on Allow as they normally do. Is this another Facebook privacy uproar in the making?